Data Theft is the most important thing to take care off, with high storage portable storage devices like USB Thumb Drives with 256 GB storage capacities, it’s easy to copy lot’s of data and an easy to use tool for transferring data across. To prevent Data Theft, you can block USB ports, give access to only white listed devices, or take a different approach like preventing Copy,Paste and Rename of files without authentication, so that no one copies data or moves them around without proper authentication. 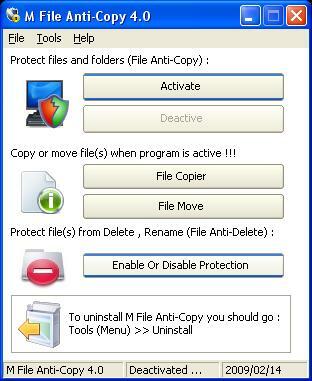 M-File AntiCopy is a free tools that helps you disable copy-paste/move/delete/rename functions on your files and folders without authentication (password protection).On the application’s first launch you need to set the password for protection and un-installation of the tool. To enable or disable protection, just click Activate for Copy Protection for Files and Folder, and Enable / Disable Protection for Delete/ Rename Protection.While the protection is enabled, you are allowed to copy and move files only via the built-in file-copier and File-Move Option from the tool’s interface.